The Extraordinary Ordinary is a new musical by Scott Burkell (Book & Lyrics) and Paul Loesel (Music). It follows a year in the life of six friends – Karen, Kate, Sam, Joey, Bev, and Zach. It is a show about choices… discovering who you are and deciding what’s important in life. It reminds us all about the joys of living in the moment and the true meaning of ”family”. Like so many of New Yorkers, these six characters are all transplants – brought together from small towns all across the country. Over the years, they have grown close, forming a family of sorts. They come together for birthdays and holidays, big moments and small. The action begins at one of Karen’s famous dinner parties, when Zach makes a joke about how “his life has no meaning.” We learn that his off-handed joke has deep-seeded roots, and that he has been slowly pulling away from his wife, Bev, for months. Weeks go by and Zach starts to open up to his newly-found friend, Sam. He reaches deep inside and starts to confess all of his deepest fears: “I go to work each day to do something I hate… Why? So that we can amass more stuff… a car, a house, a goddamn cappuccino machine.” Something is clearly missing, but he can’t figure out what. Zach eventually pulls so far away that it threatens to destroy the life he’s worked so hard to create. Then on New Year’s Eve we witness as one seemingly insignificant event ripples outward and affects everyone in the group. So much so, that it threatens to break up the group altogether. 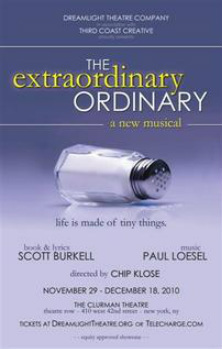 The Extraordinary Ordinary is a musical comedy with heart. It is as serious and funny as real life can be. In the end, it reminds us how special life truly is. Don’t waste time waiting around for the big moments; why not celebrate the plain old everyday moments as well?! Before it’s development with Dreamlight Theatre Company, the show received developmental readings at ASCAP and Cap21 Musical Theatre Studio, as well as a workshop production at the Philly Fringe in 2007.